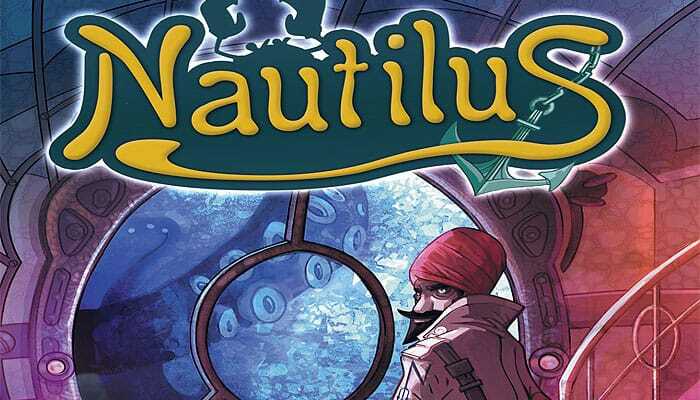 It's time for Captain Nemo to choose who will become the first mate on board of the Nautilus. Be ready to face the depths of the sea all while proving yourself the best in five great domains close to the Captain's heart. During the six rounds of the game, place your divers in order to gain the upper hand in the five great domains that are Science , Exploration , Navigation , Engineering and War . The player who has won in the most domains will be declared the winner at the end of the game. The gameboard is placed between the two players. The Diver cards are shuffled then placed in a pile at the front of the Nautilus, face down 1. The special cards are shuffled then placed in a pile at the back of the Nautilus, face down 2. The Domain cards are shuffled. Five of them are placed face- up on the five empty spaces of the game board 3. The remaining cards form the draw pile which is placed next to the game board, face down. The youngest player gets the Nemo token, thus becoming the first player of the round. Before starting a round, each player gets 5 Diver cards, which they look at secretly. Then the first player draws two special cards. After having looked at them, the player keeps one and gives the other to his or her opponent. Some special cards can be played at the beginning of the round and others during the round. These will be discarded at the end of the round, whether they have been played or not by the player who has them in hand. 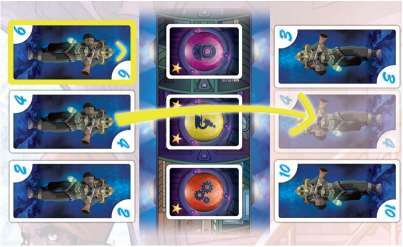 To start, the first player places one of their Diver cards face up, along the Nautilus and in front of a Domain card, either on their own side or on the side of their opponent. Then, it's up to that opponent to do the same and so on until the 10 spaces (5 on each side of the Nautilus) have been filled by a card. Note: At the end of the round, the value of the Diver cards placed face-up, on both sides of the Nautilus, will determine who gets the Domain cards in play. Cards with a vertical arrow (values of 6 and 9) allow players to send another Diver card to the empty space on the opposite side and directly across from its current position. The moved card must be, initially, on the same side as the card with the arrow has been played. 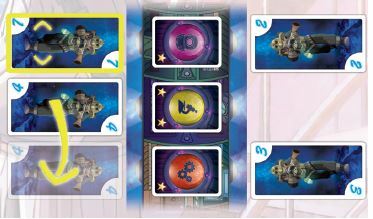 Cards with a horizontal arrow (values of 7 and 8) allow players to send another Diver card to an empty space on the same side. The moved card must be, initially, on the same side as the card with the arrow has been played. Note: a movement action is mandatory. If it is not possible to perform it, the Diver card with the arrow is still placed like a normal card. The round ends as soon as all 10 spaces on both sides of the Nautilus have been filled by a card (Diver or special). The Domain cards are then awarded. A player gets a Domain card when the value of the Diver card on their side is higher than that of the one on the opposite side. Note:1here is one exception to this rule: the Diver card of value 1 (with a crab on it) always wins against the card of value 14, and only against that card. Once gained, the Domain cards are placed in a face-down pile in front of each player, together with any cards won during previous rounds. This pile can be consulted at any time by its owner. If the draw pile of Domain cards is empty, see End of Game and Scoring. 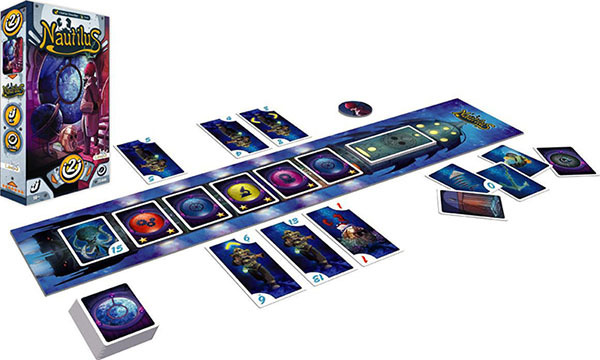 Otherwise the Nemo token is given to the opponent and 5 new Domain cards are placed face-up on the gameboard. The used Diver cards are returned to the corresponding draw pile, which is shuffled again. The special cards drawn at the be- ginning of the round are set aside, whether they've been used or not. A new round can then begin. Note: At the end of the 3rd round, reshuffle the draw pile of special cards by shuffling together the special cards previously played and dis- carded. The game ends at the end of the 6th round, when the pile of Domain cards is empty. Each player takes the pile of Domain cards won during the game. In each of the 5 domains (Science, Exploration, Navigation, Engineering, War), the players will compare their totals: two stars are worth 2 points, one star is worth 1 point and ink blot removes 1 point from the concerned domain. The player with the highest points score in a domain wins that domain. The player who wins most domains wins the game.